Vendor of standardized and customized embedded computer boards and modules, congatec, will be exhibiting at Japan IoT/M2M Expo (booth 10-42 West Hall 2, 1F), showcasing its brand new demo platforms for the next generation of Artificial Intelligence (AI) based embedded vision systems. Designed in cooperation with and verified by leading ecosystem partners including NXP Semiconductors, Intel, Basler and Real-Time Systems, the platforms offer a new level of solution readiness for various AI based embedded vision applications. congatec’s goal is to minimize design effort for OEM customers and to ensure that new applications make it to market more quickly. Target industries range from industrial, infrastructure and smart city to logistics, vehicle and retail vision applications. Embedded vision that includes Artificial Intelligence is one of the most important growth markets in embedded computing. 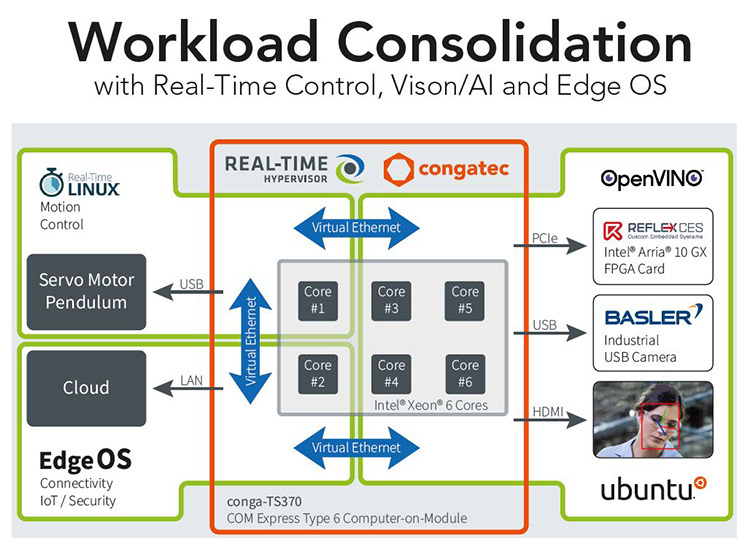 Customers in many different markets need to integrate AI and deep learning as well as camera technologies such as MIPI and real-time hypervisor technologies to consolidate real-time control and smart camera analytics on one single platform, explained Yasuyuki Tanaka, Country Manager at congatec Japan K.K. The demo system congatec designed in cooperation with Intel and Real-Time Systems targets the next generation of vision based collaborative robotics, automation controls and autonomous vehicles that have to tackle multiple tasks in parallel, including situational awareness utilizing deep learning based AI algorithms. The solution ready platform is based on a COM Express Type 6 module equipped with Intel Xeon E2 processor and integrates three preconfigured virtual machines. One operates a Basler vision camera, where the vision based object recognition runs on Linux via the Intel OpenVino software, and the AI algorithms are executed on an Intel Arria 10 FPGA card from Refexces. Another partition hosts a gateway for secure IoT connectivity. The independent real-time partition runs real-time Linux to control the balance of an inverted pendulum in real-time. Visitors can try to disturb the balance of the pendulums, the system will react instantly and with real-time behavior to keep the pendulums in balance. The congatec, Basler and NXP retail demo platform is a proof-of-concept utilizing AI to fully automate the retail checkout process. Booth visitors can select what to put in their baskets, the trained neural network then detects the products on the basis of a video stream – similar to how face recognition works – and displays the total pricing. Systems like this open a new perspective for retail applications: They make it easy to expand the sales portfolio as new products can be added to a trained neural network without a problem. Retail stores benefit from less labor costs as well as significantly improved customer experience through instant checkouts, minimized queues and 100% checkout capacity at all times, even when the shop is opened 24/7. The deep learning retail platform is based on a Basler Embedded Vision Kit consisting of an NXP i.MX 8QuadMax SoC based SMARC 2.0 Computer-on-Mo dule from congatec, a SMARC 2.0 carrier board and Basler’s dart BCON for MIPI 13 MP camera module. The Embedded Vision Kit will be available starting this summer from Basler. The congatec face recognition demo system is based on cutting-edge biometric technology and designed for applications that require real-time connectivity to a central database of images to identify people. Target applications range from high-level public infrastructure surveillance to billing, ticketing and entrance control systems. The demo focuses on face recognition and is based on Basler’s dart camera series with USB 3.0 and a conga-PA5 Pico-ITX board with 5th generation Intel Atom, Celeron or Pentium processors. Further kits based on congatec boards and modules with LVDS, MIPI-CSI, GigE vision and other relevant interfaces will follow. The pylon camera software suite from Basler will also be integrated by congatec as standard software into appropriate kits.